​Grace Wang, 15, is a 10th grader at Richard Montgomery High School in Maryland. She has been studying piano since age four and is a student of Dr. Marjorie Lee. Grace has been the top prizewinner in many local, national and international piano competitions such as the Music Teachers National Association (Maryland, Virginia, and Washington, DC) Competitions, Asian American Music Society International Competition, Robert Spencer Concerto Competition, Gertrude Brown Memorial Piano Competition, Hartman Piano Performance Awards, Gottlieb Memorial Competition, the American Protégé International Talent Search, and most recently, the National Symphony Orchestra's Young Soloist Competition. This summer, she will continue her musical journey at the Tanglewood Institute at Boston University in the Young Artists Piano Program. Piano and a love for music has inspired her to share her music and its benefits with the world, as can be seen in the hours she spends volunteering and playing in places such as hospitals and retirement homes. 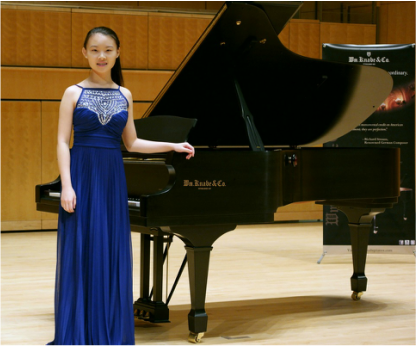 Eirena Li, 15 years-old, a freshman of Winston Churchill High School in Potomac, Maryland, has been studying piano with Mrs. Hyun Park since 2009. Eirena has received many awards in various competitions, including second place in the 2016 American Protégé International Concerto Competition, first place in the Gertrude S. Brown Memorial Concerto Competition, Junior Division (2012) and Intermediate Division (2016); second place (2013) and third place (2015) at the Miriam S. Gottlieb Memorial Competition; and the Grand Prix Awards in the Music Fest Rising Talents in 2015 and 2016, for which she performed and will perform again at the Carnegie Hall in New York City. Eirena has also been awarded multiple times in the Maryland State Music Teachers Association Solo and Ensemble competitions. Eirena was a piano accompanist for the Young Artists of America in the productions of "Jekyll & Hyde in Concert" (Fall 2015) and "Children of Eden" (Spring 2016), and currently accompanies her school's orchestra. Under Mrs. Park's guidance and continuous encouragement, Eirena avidly enjoys the many wonders of music, from Baroque works to contemporary pieces. Her passion for music and the arts bolsters her confidence in achieving higher excellence in her social life and academia. ​​Emily Tian resides in Gaithersburg, Maryland. She is 14 years old, and began playing piano when she was six years old. She has been a student of Dr. Svetlana Volkova since she started playing piano. Emily has won the prestigious Miriam S. Gottlieb piano competition twice, come in second in the International Young Artist's Piano Competition, and received accolades annually at the Maryland Spring Solo/Duet Festival. Her repertoire is varied, but she especially enjoys playing Liszt and Beethoven. After playing piano for so many years, Emily has decided to pursue piano study in college. She is a freshman in the IB program at Richard Montgomery High School in Rockville. Besides playing piano, Emily enjoys playing lacrosse, writing, and participating in Model UN. Joyce Lee is 16 years old and attends high school in Northern Virginia. She currently studies with Margarita Gramaticova. She has been studying piano for about six years. This past year, she has received honors at the NVMTA Bach-Baroque Competition and Sonata Festival, as well as first place in the WMTA Viola Hartman Piano Performance Awards. Since starting piano lessons, Joyce has discovered a passion for music and has greatly developed in artistic and technical skills. Throughout her musical studies, she has learned to appreciate a variety of genres of piano music. It has broadened her musical horizons and allowed her to mature as an artist as well as an individual.